A-PDF TIFF Merge and Split is a simple, lightning-fast desktop utility program that lets you merge single or multi-page TIFF files into one single multi-page TIFF file or split multipage TIFF files into many single page TIFF files with efficiency and reliability. Besides, the tool can split and convert TIFF to JPEG, BMP, GIF, and PNG. Merge or Split TIFF files exceptionally fast! Drag and drop files to be merged or splitted. Split TIFF and convert to TIFF, BMP, GIF, JPG and PNG. A-PDF TIFF Merge and Split can combine or cut hundreds TIFF documents quickly. 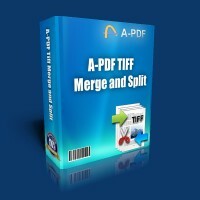 A-PDF TIFF Merge and Split is a standalone program costing only $27.